HAMPTON, VA- Hampton women's basketball hosted its fourth annual "Junior Day" event Sept. 23 and 24, to recruit high school athletes. Seventy people attended, including 30 student-athletes from more than 15 different cities. 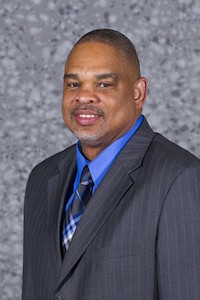 Hampton University's athletic budget does not allow coaching staff to do home visits with recruits, but coaches found a way to turn that negative into a positive. "Not being able to do home visits started to become a disadvantage, so I created "Junior Day," said Timothy Valentine, associate head coach. "This makes up for the home visit recruiting that we cannot afford to do." Many recruits traveled from the West coast and Midwest. It took those who did over a day just to get to Hampton, Va.
Tori Davis, a 16-year-old high school sophomore, traveled with his family from Phoenix, Arizona for a firsthand HBCU experience. "I did not know what an HBCU was up until a few months ago," Davis said. "I feel that people my age need to experience and know about them, so that's why I came." The recruits saw a day in a college athlete life firsthand. "I like how we were able to watch the team practice and tour their locker room," said Ja' Niah Henson, a 16-year-old high school junior from Baltimore, Maryland. "It was cool to hang with the players without the coaches and my parents." Adria Strothers has more appreciation for "Junior Day" now that she experienced it as a player instead of a recruit. "Junior Day" convinced her to come to Hampton, she said. 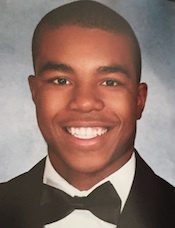 "Junior Day played a big part in my commitment to Hampton," said Strothers. 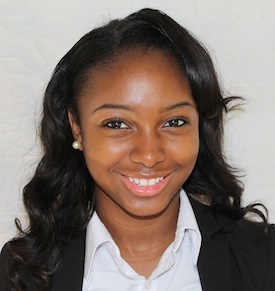 "It made me fall in love with the school and want to spend the next three years here." Recruits and families said they enjoyed the event. "Recruits are already looking forward to coming down for next year's event," said Jermaine Brown, assistant coach. "One recruit even told her mother she wants to go to school here." 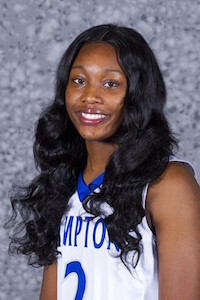 In the first round of the NCAA women's basketball tournament, the 15th seeded Hampton University Lady Pirates (20-12) will play the second-seeded, nationally ranked Duke Lady Blue Devils 9 p.m. Saturday March 18. This is not the first time that Hampton and Duke have seen each other. It is the third encounter out of the six times that the Hampton women have been in the NCAA tourney in the past eight seasons. Duke won the last meeting on March 24, 2013 by a 67-51 count. In 2010, Hampton lost 72-37. A 15th seed beating a 2nd seed team has been done before by three Historically Black Colleges and Universities, all men's teams from the Mid-Eastern Athletic Conference (MEAC): Hampton University, Norfolk State, and Coppin State University. The Lady Pirates defeated Bethune Cookman University 52-49 and earned the 2017 MEAC tournament championship on March 11. 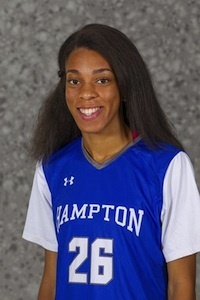 All-time scorer Malia Tate-DeFreitas, plus Ashley Bates and Chanel Green were three Hampton University regular-season starters that were sidelined because of injuries. Low post player Kaylah Lupoe was injured during the MEAC championship game. Together, the four student-athletes accounted for 57.5 percent of the team scoring. "It was unlikely and improbable. We've got three starters sitting on the sideline, and then Lupoe gets hurt," said coach David Six (photo right). "And we still find a way." "I am just so thankful to be a part of this team. When everyone thought we were going to lose or give up, we actually won," said Monnazjea Finney-Smith (photo right), member of the MEAC all-tournament team. "To be able to play against a great team [Duke] with such a great history is just exciting. "I trust my coach will prepare us and have a great game plan, and I am definitely excited to be here." To catch the game, tune into ESPN3 at 9 p.m. on Saturday. If you want to support the Lady Pirates at the game in Durham, North Carolina, the Office of Student Activities is taking a bus to to cheer the girls on. The first 200 people to sign up can go for free. A mass email was sent notifying students to "Get on the Bus." In addition to a free ride and ticket to the game the passengers also get free T-shirts and lunch boxes. "I want to make sure that the team has full support from their peers," said Anzell Harrell, director of student activities, "because I have watched them work so hard to get to this point." 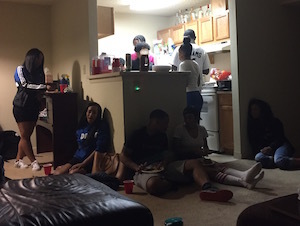 Some Hampton students speculated on whether the women's basketball team could make it past Saturday. "I get scared when I hear big-school names like Duke compared to Hampton. They probably think it's going to be an easy win," said Isaiah Spencer, a sophomore journalism major from Montclair, New Jersey. "I know we're going to prove them wrong." "Who is the real HU," you might ask? 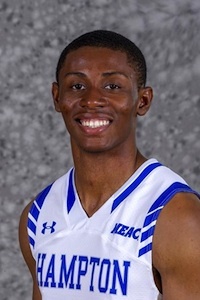 Well, the Hampton University women's and men's basketball teams take on Howard University Saturday at 4 and 6 p.m. at Hampton University's Convocation Center. 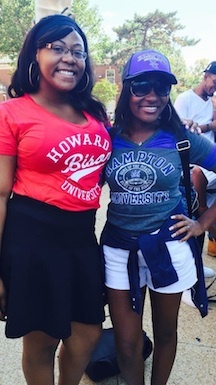 Students and alumni from Howard, Hampton and nearby universities attend each year. 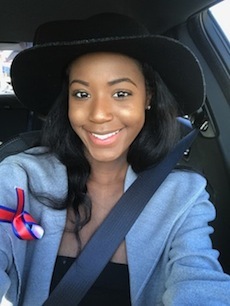 Diamond Broughton, a sophomore strategic communications major and member of the Blue Thunder cheerleading, squad says "Practice is more fun because we get to come up with new material to show off." Said Broughton, "We put a little extra 'umph' into our appearance and performance." "Other games, we usually don't have anyone to cheer against," said Broughton. "Most people don't realize cheerleaders have their own secret game going on, on the sideline." What's a basketball game without a crowd? Students who do not regularly attend Hampton home basketball games plan to attend this one. "At games like this, the band plays new music, the cheerleaders are intense, and the crowd is more involved" said sophomore pharmacy major Tyra Smith. It is safe to say that the cheerleading team's hard work doesn't go unnoticed. There should be more attendees, dressed to impress at this week's game. The Blue Thunder cheerleading team members said they are ready for this week's rivalry. Watch the cheerleaders live in action Saturday. Tickets can be purchased at ticketmaster.com. The game was on mute. There were conversations about what kind of brownies should be made next. Little attention was being paid to the game at all but the Hampton University students were concerned about one thing: the halftime show. Lady Gaga was performing and the women were super excited to see what dynamic she was going to bring to the concert this year. Last year's Super Bowl performance by Beyoncé was utterly amazing, said some of the women, and the reunion of the iconic trio Destiny's Child made history. "This year's show has to upstage last year's performance or it's going to be terrible," said Aalexis Campbell, a sophomore nursing major from California. As the countdown for the show began, people's attention was focused on the projector screening Super Bowl LI. At 8:13 p.m. Lady Gaga started the halftime show on the roof of NRG Stadium in Houston, paying tribute to America. Soon after that tribute Gaga jumped off the top of the stadium and onto the stage to begin her performance. "That was definitely extremely expected and pretty cliche jumping off the roof," said Ayanna Mondesir, a sophomore history major from New York. "The show directors could have picked something cooler to do instead." As Gaga continued the performance it just declined, said observers. "She looks under rehearsed and confused with the directions," said Ashley Mckie, a sophomore strategic communications major from New York. Once 8:20 p.m. came, the young ladies were up making brownies. "My birthday is Sunday, so a Super Bowl win would be the best present I could ask for." Fans such as Kaelyn Lowe, a sophomore journalism major/leadership studies minor from Stone Mountain, Georgia, have pre game rituals when cheering on their favorite teams and specific ways they enjoy watching football games. "I can't believe I forgot my Falcons jersey at home," she said. "I wear it every game. "I still think my Falcons will go all the way!" "It's really a great feeling to see the Falcons finally going to the Super Bowl in my lifetime," said Jeffrey Lowe, an electrical engineering major from Stone Mountain, Georgia. "I've been a fan since I was born and it's been a tough ride being a Falcons fan. It always seems like they'd get your hopes up and then find some way to disappoint you. A win in the Super Bowl would mean so much for the city and the real fans. "I'll be watching with some friends. Anybody who has the Patriots winning might just lose their money." This is Super Bowl specifically monumental for the Falcons and their fans because it has been almost 15 years since the team went to the big game. Atlanta Mayor Kassim Reed Friday signed an order that allows bars in the city to stay open until 3 a.m. Sunday night through Monday before dawn. As for the Patriots, New England has gone to the Super Bowl eight times and have been victorious four times. Bill Belichick is a highly respected coach in the National Football League. Hampton students from the East Coast who are Patriots fans said they were confident. "I mean come on, Tom Brady is the No. 1 quarterback in the NFL right now there is no way we aren't going to Disney,' said Marshall Gordon, a freshman business management major from Reston, Virginia. "I don't think it will be a blowout for the Falcons or Patriots, but the Patriots have the upper hand with our amazing offense." Zachary Bragg (photo right), a sophomore journalism major/sports management minor From Roselle, New Jersey, said "I'm going to watch the game in my dorm room. "That way when I comment and talk trash on every play, I won't disturb anyone." This game will be watched by millions of people all around the world, and only one team will become champions. Whether you are a Falcons fan, Patriots fan, or just there for the food, drink and commercials, the Super Bowl is a big deal. 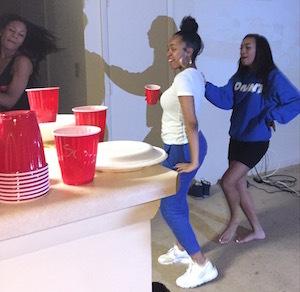 For those who have nowhere to go but just want to be around other students, the Hampton U. 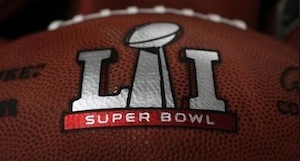 Student Government Association is hosting a Super Bowl watch party inside the Student Center Ballroom at 6 p.m.